You are 2 today! Two years ago, myself and Daddy were blessed to have you come into our lives, and oh how much you have grown since that day you popped out looking like a cross between a blue avatar and a wrinkly old man. You still are, and will always be, the apple of my eye. Daddy and I love you oh so very much, and we are enjoying watching you grow up into a little boy, with your own mind, decisions and opinions. You are growing quite tall now, I have had SO many people tell me that you are tall for your age. You can thank your dad’s genes for that, and I am sure you will surpass his height of 6 feet, though Daddy doesn’t want to think you will. You have all your teeth now too and you sure put them to good use by chomping away on anything you can get your hands on. You have my love for sushi and you demand your uncle to get you “PIZHA” (pizza) and “MAANO” (mango) every SINGLE day. Your speech is a new thing too and it has grown leaps and bounds in the last couple of weeks. You sure know how to communicate what you want, whether it is with broken words or signs. My favourite word that you have learnt to say is of course “Mummy”, it melts my heart every time you say it. You have started to string together two or three words and can’t really stop babbling since the moment you wake up. It is both adorable and annoying at the same time! haha! Yes, the Terrible Twos has brought upon us a few tantrums for sure, and we go through our fair share of troublesome phases. Thankfully, they are short lived, and your infectious laughter soon after those episodes make us forget anything ever happened. Your fascination with vehicles, be it cars, trains, diggers or buses, is insane. You never miss a chance to point to them and let us know you have seen one of those on the roads, and it almost always means you will come right up to my face and repeat “Bus Bus Bus Bus Bus….” until I acknowledge you. And then you see a taxi and start repeating “Taki Taki Taki…” again. Oh how you make us laugh, little one. I could go on and on about you, and write an entire book but I suppose the most important thing I want to tell you is that you have brought me and Daddy a LOT of happiness by being just you. So please carry on doing that. Carry on being the babbling little mischief maker who loves food and cars. Carrying on being the light of our eyes. Carry on growing into the boy and man you are destined to be. Carry on being Baby Z. May Allah bless you with many more years, filled with happiness, love and success in both this life and the hereafter. Lots of love, cuddles, kisses and hugs. 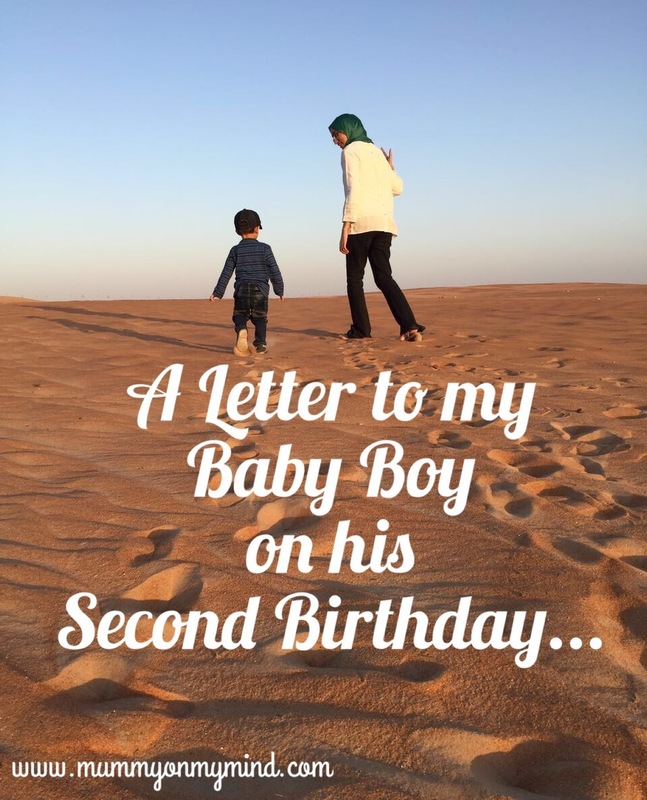 If you are interested, go ahead and read my letters to Baby Z on his First Birthday here and Third Birthday here.